The Russian National Championships are in full swing, with the first day of competition in the books. The all-around and team qualifications took place today in Penza, where World and Olympic gold medalist Aliya Mustafina (Moscow) walked away with her fourth national title. Mustafina scored a 59.566, nearly a point and a half higher than her fellow Moscow teammate in the silver position, Alla Sosnitskaya (58.067). 2012 Olympian Anastasia Grishina (56.467) rounded out the podium in bronze for a Moscow sweep of the medals. Mustafina had the highest scores on balance beam and floor. Maintaining her reputation as the reigning world champion on beam, she delivered a solid beam set earning her a 15.4, the highest beam score of the year at any of the major international events. Mustafina earned a deduction on bars for hitting her feet on the mat, which took her out of the top three on what is usually her best event. Sosnitskaya is a second year senior, and has not represented Russia on the world stage. She had a solid meet, hitting four for four routines. Her best event is floor, where she had the second highest score of the competition with a 14.833. There were high hopes in the Russian camp that Grishina would really shine at this competition. While she managed to get on to the podium, her performance was not one that gives any confidence that 2014 will be a stronger year for her than she has shown in the past. Grishina has long been viewed as a talented gymnast who could really help round out Russia’s all-arounders for serious medal contention on the world stage. She has not yet been able to deliver that kind of performance, and many are hoping that this will be her year. One of the most anticipated aspect of the championships was Olympic silver medalist Viktoria Komova’s return to competition after a year and a half absence. Komova competed on three events. Her best event was no surprise, scoring 14.900 on bars which put her as the third highest score on the event. She competed a simple and low valued vault, did not compete on floor, and had a rough beam routine earning only an 11.6. Surprising everyone, World and Olympic team medalist Ksenia Afanasyeva decided to compete at the last moment to help her team qualify. She came out with the second highest vault score despite heavily taped ankles due to her lingering ankle injury. World and Olympic teammate Tatiana Nabieva, and reigning Russian National Champion was also a surprise in the competition as she had declared her retirement from gymnastics over social media at the end of 2013. Other notable routines included Russia’s vaulting specialist 2012 Olympian Maria Paseka, who had the highest vault score of the competition, scoring a 15.033. First year senior Daria Spiridonova put up the highest bar’s score with a 15.133, while 2013 World team member Anna Rodionova came away with the second highest score at 15.06. Second year senior Polina Fedorova scored the second highest of the day on beam with a 14.500. Tune in to Russian gymnastics on their website at sportgymrus.ru, where the remainder of the competition will be livestreamed. Available videos from today’s competition are linked or shown below. Kyla just gets better with age. 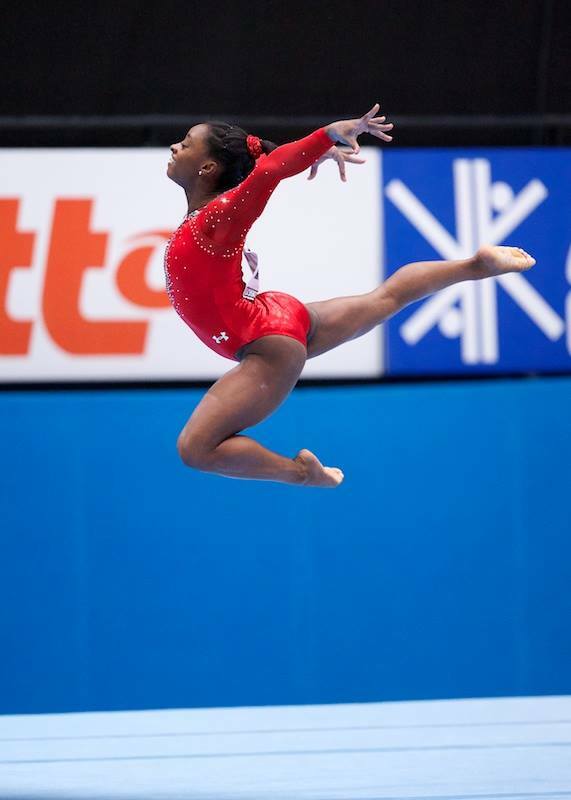 As you would expect, her time at the Olympics has given her maturity and depth that shows in her gymnastics. Especially in her floor routine. She used to just go from pose to pose. At Classics, she seemed to FEEL the music and danced beautifully. With a watered down beam routine and an uncharacteristic fall on floor, she still took the title. Peyton was a bit of a surprise, but she came through with four solid routines all done with beauty and elegance. She is a joy to watch perform and will be one to watch for sure at Nationals. Brenna has upgraded everywhere, and it was really fun to see her compete everything. She has some cleaning up to do to make her execution match her difficulty, but she did great for her first debut of so many difficult skills. There is nothing secret about the Secret US Classic (so named for it’s sponsor). Plenty of bloggers are on site, Gym Examiner is giving live updates, USA Gymnastics and Gymnastike are posting podium training videos and the seniors will be live-streamed and broadcast on Universal Sports. It’s enough to make a gymnastics fan do cartwheels of joy! As we gear up for the competition tomorrow, here are the rumors and things we can expect from the U.S. Secret Classic. After so many gymnasts announcing that they would just be doing a few events, I began to despair about the all around for this meet. But it is looking like it might e a great competition after all. In fact, it might give us a preview of that coveted second all around spot for the Olympic team. Gabby Douglas is apparently doing the all around after all according to an article in the Des Moines Register. Aly Raisman will be competing all around, as will Kyla Ross and Anna Li. Chellsie Memmel still has to qualify to nationals so she will be competing all-around as well. Many others may join in the fray, but we will have to wait and see. Either way, it should be be a great competition! According to camp videos and podium training videos, we have upgrades galore – and not surprisingly most of them are on bars. Anna Li, Brandie Jay, McKenzie Wofford and Wieber all have upgrades on bars from the last time we have seen them. Sabrina Vega has upgrades on beam, McKayla Maroney has upgraded her second vault and has minor upgrades other places. Despite a US reputation, we might be in for a real treat on floor. Sarah Finnegan is absolutely delightful to watch on floor – her poise and style are light, elegant and refreshing to see. Anna Li will be debuting her new routine as well. Is it a floor routine or a heart pulling, dramatic and breathtaking dance piece? I am not sure! It is incredible though and a treat to watch. And of course we will be treated to the beautiful lines of Nastia Liukin as she returns to competition on beam and Kyla Ross. We will finally see a few more pieces toward completing the puzzle of our US Olympic team. It should be a great weekend!